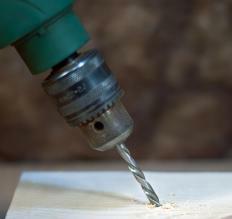 Carbide drill bits can be used on steel, masonry and other hard objects. A carbide drill bit is made of high carbon steel with an extra tough and durable carbide coating on the tip. With this coating, the carbide drill bit is able to drill a hole in masonry, stone and very tough steel without burning the tip of the drill bit up due to the tremendous amount of heat being generated. The typical carbide drill bit is best suited for use at low to medium-high speed since heat is the greatest enemy of this type of drill bit. Often used with a cooling fluid, a carbide drill bit may be used for precision cutting and drilling in a computer-aided cutting machine to make many continuous cuts without replacing the bit. When drilling holes into concrete and stone surfaces, a carbide drill bit is often the best choice because it is well-suited for making multiple holes without replacing the bit. The superior strength of the carbide drill bit allows the bit to chew through the very hard material without elongating the hole. The softer drill bit material of carbon steel will often cut through the hard concrete and stone surface if enough time is taken to avoid burning the cutting edges of the drill bit; however, the finished hole will typically be egg-shaped due to the softer drill bit moving around as it attempts to cut through the material. Conversely, a hardened carbide drill bit will not move around as it cuts, resulting in a much rounder and truer finished hole. The carbide drill bit is the preferred slow-speed cutting tool of drilling and boring companies that specialize in masonry and rock boring. By adding a cooling fluid to the cutting edge of the tool, it can also endure high-speed use applications, including milling machine and computer-aided cutting machines. The durability of the hard carbide cutting tools allows for extended use on large cutting projects while retaining the sharp, crisp edges on the finished cut. This is especially important on precision cutting instruments used to complete finished work. On smaller cutting tools such as the high-speed rotary-type tools, the use of a carbide cutter allows the user to make many small cuts at very high speed without burning the cutting edge of the tool. In this type of tool, the cutting edge is actually cooled by the air as the drill bit turns at speeds up to 10,000 revolutions per minute. When used on softer materials such as aluminum and brass, a single carbide drill bit can last indefinitely provided the bit is not forced to cut and suffers a burned cutting edge. What is a Pilot Bit?